Until that day arrives, Grosz, the Higgins Professor of Natural Sciences at the Harvard John A. Paulson School of Engineering and Applied Sciences (SEAS), is working to instill in the next generation of computer scientists a mindset that considers the societal impact of their work, and the ethical reasoning and communications skills to do so. At a time when computer science departments around the country are grappling with how to turn out graduates who understand ethics as well as algorithms, Harvard is taking a novel approach. In 2015, Grosz designed a new course called “Intelligent Systems: Design and Ethical Challenges.” An expert in artificial intelligence and a pioneer in natural language processing, Grosz turned to colleagues from Harvard’s philosophy department to co-teach the course. They interspersed into the course’s technical content a series of real-life ethical conundrums and the relevant philosophical theories necessary to evaluate them. This forced students to confront questions that, unlike most computer science problems, have no obvious correct answer. Students responded. The course quickly attracted a following and by the second year 140 people were competing for 30 spots. There was a demand for more such courses, not only on the part of students, but by Grosz’s computer science faculty colleagues as well. “The faculty thought this was interesting and important, but they didn’t have expertise in ethics to teach it themselves,” she said. In response, Grosz and collaborator Alison Simmons, the Samuel H. Wolcott Professor of Philosophy, developed a model that draws on the expertise of the philosophy department and integrates it into a growing list of more than a dozen computer science courses, from introductory programming to graduate-level theory. Under the initiative, dubbed Embedded EthiCS, philosophy graduate students are paired with computer science faculty members. Together, they review the course material and decide on an ethically rich topic that will naturally arise from the content. A graduate student identifies readings and develops a case study, activities, and assignments that will reinforce the material. The computer science and philosophy instructors teach side by side when the Embedded EthiCS material is brought to the classroom. Grosz and her philosophy colleagues are at the center of a movement that they hope will spread to computer science programs around the country. Harvard’s “distributed pedagogy” approach is different from many university programs that treat ethics by adding a stand-alone course that is, more often than not, just an elective for computer science majors. Embedding ethics across the curriculum helps computer science students see how ethical issues can arise from many contexts, issues ranging from the way social networks facilitate the spread of false information to censorship to machine-learning techniques that empower statistical inferences in employment and in the criminal justice system. 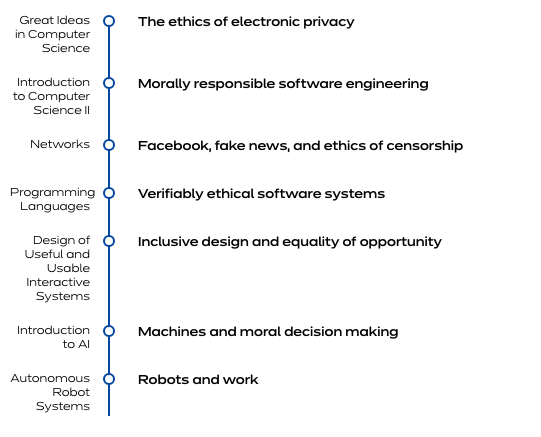 Courses in artificial intelligence and machine learning are obvious areas for ethical discussions, but Embedded EthiCS also has built modules for less-obvious pairings, such as applied algebra. “We really want to get students habituated to thinking: How might an ethical issue arise in this context or that context?” Simmons said. Grosz acknowledged that it can be a challenge for computer science faculty and their students to wrap their heads around often opaque ethical quandaries. 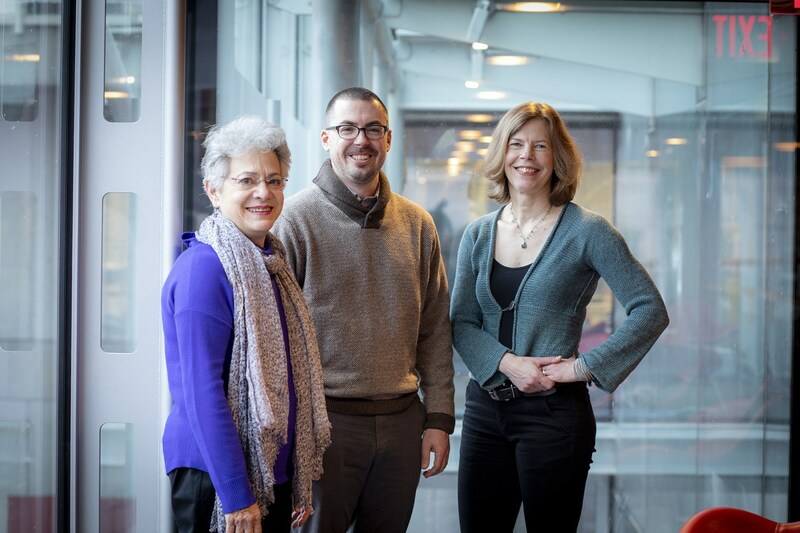 Jeffrey Behrends, currently a fellow-in-residence at Harvard’s Edmond J. Safra Center for Ethics, has co-taught the design and ethics course with Grosz. Behrends said the experience revealed greater harmony between the two fields than one might expect. The Embedded EthiCS model has attracted interest from universities — and companies — around the country. Recently, experts from more than 20 institutions gathered at Harvard for a workshop on the challenges and best practices for integrating ethics into computer science curricula. Mary Gray, a senior researcher at Microsoft Research (and a fellow at Harvard’s Berkman Klein Center for Internet and Society), who helped convene the gathering, said that in addition to impeccable technical chops, employers increasingly are looking for people who understand the need to create technology that is accessible and socially responsible. “Our challenge in industry is to help researchers and practitioners not see ethics as a box that has to be checked at the end, but rather to think about these things from the very beginning of a project,” Gray said. Those concerns recently inspired the Association for Computing Machinery (ACM), the world’s largest scientific and educational computing society, to update its code of ethics for the first time since 1992. In hope of spreading the Embedded EthiCS concept widely across the computer science landscape, Grosz and colleagues have authored a paper to be published in the journal Communications of the ACM and launched a website to serve as an open-source repository of their most successful course modules. They envision a culture shift that leads to a new generation of ethically minded computer science practitioners. “In our dream world, success will lead to better-informed policymakers and new corporate models of organization that build ethics into all stages of design and corporate leadership,” Behrends says. The experiment has also led to interesting conversations beyond the realm of computer science. At the heart of the Embedded EthiCS program are carefully designed, course-specific modules, collaboratively developed by faculty from computer science and philosophy. A module created for a course taught by Professor Finale Doshi-Velez asks students to grapple with questions of how machine-learning models can be discriminatory, and how that discrimination can be reduced. An introductory lecture sets out a philosophical framework of what discrimination is, including the concepts of disparate treatment and impact. Students learn how eliminating discrimination in machine learning requires more than simply reducing bias in the technical sense. Even setting a socially good task may not be enough to reduce discrimination, since machine learning relies on predictively useful correlations and those correlations sometimes result in increased inequality between groups. The module illuminates the ramifications and potential limitations of using a disparate impact definition to identify discrimination. It also introduces technical computer science work on discrimination — statistical fairness criteria. An in-class exercise focuses on a case in which an algorithm that predicts the success of job applicants to sales positions at a major retailer results in fewer African-Americans being recommended for positions than white applicants. An out-of-class assignment asks students to draw on this grounding to address a concrete ethical problem faced by working computer scientists (that is, software engineers working for the Department of Labor). The assignment gives students an opportunity to apply the material to a real-world problem of the sort they might face in their careers, and asks them to articulate and defend their approach to solving the problem.